Monopoly 250k slot has a pretty self-explanatory title - it's based on the old Hasbro board game Monopoly and you can win 250 thousand coins. 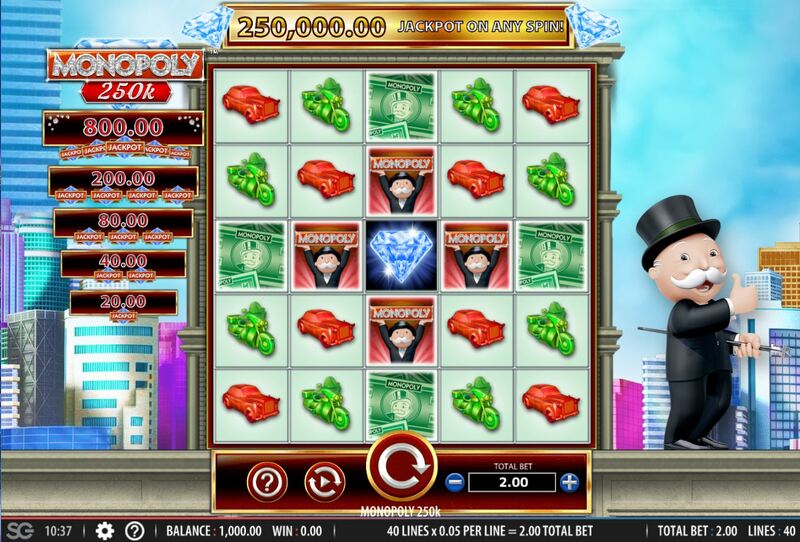 That's the good bit, but I can say with certainty that just about any other slot with this theme of which there are many including Super Monopoly Money, Monopoly Big Event, Monopoly Dream Life etc. are going to be better. It's not the appearance, which naturally features the man in the bowler hat and the usual city sketch behind the reels nor the cheesy jaunty music, but the fact Bally have done a Wonder Woman Bullets And Bracelets with the game. If you're wondering what that means it will become apparent soon, so until then is it worth investing in these properties or will your bankroll turn into - well, Monopoly money? We get 25 separate reel tiles on a 5x5 grid with Monopoly 250k slot and we pay 40 coins for 40 paying lines. Now unfortunately Bally have made the pays incredibly low on the game as they did with the aforementioned Wonder Woman slot. You 5-of-a-kinds are terrible, with 100 coins or 2.5x bet if you like for the Wild or Diamond, Red, Green or Blue Man 50 with the Plane, Bike, Car or Yacht at 25 coins for a full line of five. There are scatters only appearing on tiles 1, 13 and 25 which can trigger the bonus but surely we'll get some in-play random stuff to make up for the shocking line pays? Community Chest - you will pick a card which offers a 2, 3, 5 or 10x multiplier for any wins on that spin. Err...10x very little is just a little! Chance and Mystery Symbols - these can appear on the reels after a spin and will all reveal the same symbol. If both appear you may get a different symbol for either one. Railroad Bonus - 8 free spins where the train reveals a multiplier of 2 to 10x after each or a cash award of 1 to 5x bet. No retrigger. Free Parking Bonus - 23 cars and you pick 5 to reveal small cash awards of 1 to 7x or jackpot symbols. 1 Jackpot symbol is 10x bet, if you got all 5 it would be 400x bet. 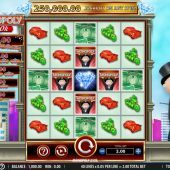 Electric Company Bonus - 10 free spins with lamps added to the grid and if a switch icon appears on reel 25, the bottom right tile, then all lamps in view award a cash amount of 2 to 25x bet. No retrigger but a +2 can appear on reel 25 too, for extra spins. Go To Jail Bonus - 3 dice rolls. Throw a double and if you achieve this first go 75x bet, second 25x bet and third throw 10x bet. Fail in all 3 attempts you get 5x bet. Whoopee! On any losing base game spin you can win a the random 250,000 jackpot, out of nowhere.